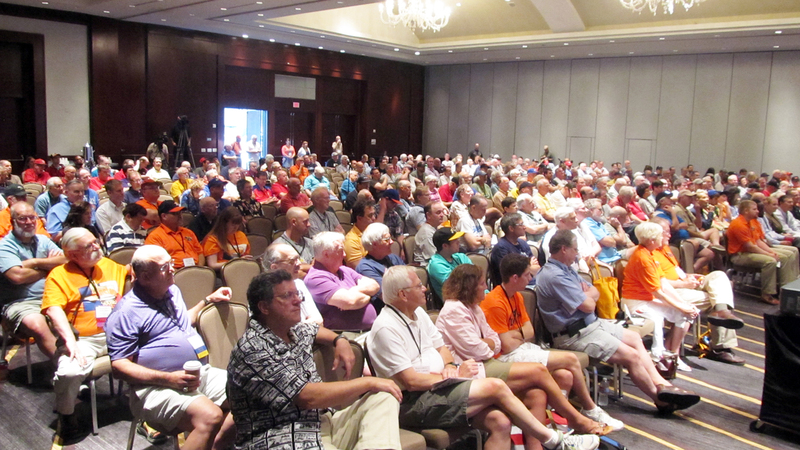 Houston Astros executive Reid Ryan delivered the opening remarks at SABR 44 on July 31, 2014, at the Royal Sonesta Houston. 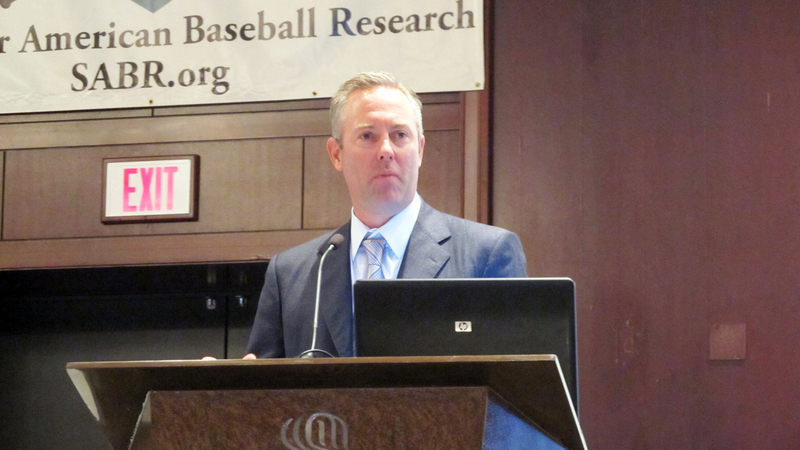 Ryan was named President of Business Operations for the Houston Astros in May 2013. The oldest son of Hall of Fame pitcher Nolan Ryan, he compiled a great deal of experience moving up through professional baseball, as founder and CEO of the Round Rock Express and Corpus Christi Hooks, affiliates of the Astros and Texas Rangers that are annually among the minor league attendance leaders. He also serves on the Board of Trustees for Minor League Baseball. After playing collegiately and graduating from Texas Christian University, Reid Ryan pitched in the Texas Rangers organization in 1994 and '95 before moving into management. "To see the Astros go to the playoffs for the first time ever, to be in that situation in Game Five (of the 1980 NLCS) against the Phillies and my dad with the ball … it's still to this day the toughest loss that our family has ever been a part of. But it energized the city; people really came out of the woodwork. When you had the Astrodome filled with so many people … if you haven't been a part of a playoff experience like that, it can just change your life. It's a feeling you want to have again. … So that really instilled a desire (in me) at an early age to want to be involved in this game." "Those Astros teams were special. And a lot of those folks still work with us today: Jose Cruz, Alan Ashby, Craig Reynolds, Terry Puhl, Enos Cabell, Mike Scott, Dave Smith … there was a group of guys that stayed together for a decade. It became my team, my guys. When I look at my role today with the Astros, that's what we want to do. We want to make emotional connections with the fans and we want to win." "It is out there every day, at every single level from independent ball to Single-A, Double-A, Triple-A, connecting people, building fans, just bringing out all the great attributes of this game. The fun that we have at the minor league level is unparalleled in baseball. The pressure rachets up, the money rachets up, everything changes, the careers are shorter. But especially at the lower levels, it's just a lot of fun." "[In the late 1990s] the minor leagues really had not grown. There was a team in El Paso, one in Midland, and one in San Antonio. That was it for minor league baseball in the state of Texas. So I came home one night and told my wife, 'I'm going to start a minor league baseball team.' Here was her answer: 'OK, great, I'm going back to bed.' So I had her endorsement, that was the good news. So I tried to figure out how to do this thing. … We've worked real hard to improve stadium conditions around the country, improve the way the players are treated. You look around the state now, and I don't know that baseball has ever been in a better spot than it is today, on every level. I feel like I had a small part to do with that, and it gives me a lot of pride." "If I've heard my dad say it once, I've heard him say it 100 times. And I couldn't have achieved anything in life or in this game had this not stuck with me. But he always said: Don't let the failure of your last pitch ruin the success of your next one. So that's what we're trying to do with the Houston Astros. We're not worried about last season, the season behind that, we're not worried about last series. We're worried about today and tackling the beast that's in front of us today." "We've got a group of guys led by Jeff Luhnow who are trying to do things differently. … Coming in and really tearing down to the bare bones, making the sausage in front of everybody's eyes, is an ugly process. But I think folks are starting to see this year that we're starting to get more talent at the major league level. … Guys like [George] Springer, [Jon] Singleton, obviously Jose Altuve — who to me is one of the most exciting players in baseball — Dallas Keuchel and Jarred Cosart coming in, they have people believing there is talent in the system again. You look at the championships we're winning in the minor leagues. We have really restocked and we're positioned now." This page was last updated October 9, 2017 at 4:33 pm MST.